Posted on Sun, Nov 13, 2011 : 5:55 a.m. The latest statistics about the health of Washtenaw County residents might surprise you. Twenty-two percent of adults in the country reported being diagnosed with depression in 2010, and 14 percent reported 10 or more poor mental health days in the month before they were surveyed. Overall, the general health of more than 12 percent of the county's population is reported as being fair or poor. Those numbers are from the 2010 Health Improvement Plan (HIP) Survey, a survey of 2,000 local households that has been done in Washtenaw County every five years since 1995. Adreanne Waller, of the Washtenaw County Health Department, says that as the economy has worsened, so have mental and physical health. "Hopelessness, unemployment, lack of housing stability, and fewer educational opportunities all contribute," said Waller. "Unfortunately, poor economic conditions have long been linked to poor mental health, including depression, anxiety, suicidal thoughts and attempts." Nearly 11 percent of those surveyed in Washtenaw County said they couldn't afford health insurance, which increases the chances of illness and disability. "Lack of health insurance reduces likelihood that individuals will have medical conditions diagnosed and treated," said Waller. "Health insurance increases the likelihood that individuals will have a consistent relationship with a single health-care provider who is aware of ongoing health and medical needs for the patient." Michigan is the 10th fattest state in the nation, and every county in the state continues to get heavier. "When comparing our county as a whole with the rest of the state on key indicators, our county appears healthier on several of them," said Keven Mosley-Koehler, senior health analyst and HIP coordinator. She said 66 percent of Michigan's population is overweight as compared to 59 percent in Washtenaw County. The rate is 67 percent in Ypsilanti, 63 percent in Western Washtenaw, and 50 percent in Ann Arbor. The consumption of five servings a day of fruit and vegetables is down from nearly 25 percent of people in Washtenaw County in 2005 to 17.6 percent in 2010. Waller said there are 33 percent fewer grocery stores per capita in the county in the last three years and that restaurants and fast-food vendors are filling the void. However, the popularity of farmers' markets in the county has increased in recent years. "The Ann Arbor Farmers Market has experienced a more robust interest in locally produced and sourced items," said Cathy King, from Frog Holler Farm in Brooklyn, Michigan. "The positive comments from our customers all seem to center around the local products and the direct contact with the growers and the superior quality of fresh produce." Other vendors at the Ann Arbor Farmers' Market, such as Mark and Joanne Wilson of Wilson's Farm in Tipton, agree. 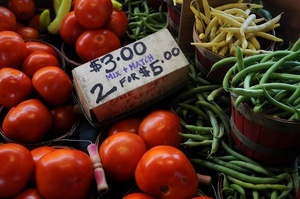 "We have seen an increase in our business at the Ann Arbor Farmers Market over the last five years," said Mark Wilson. "Our customers say they love our produce, especially our heirloom tomatoes, and they enjoy how we display them." Amanda Edmonds is the executive director of Growing Hope, the Ypsilanti-based nonprofit, which has run the Downtown Ypsilanti Farmers' Market since 2006. She has seen a big increase in people purchasing fruits and vegetables. "We were one of the first farmers' markets in the state to accept food stamps for fruits and vegetables and we have seen a growing number of people who want that access," said Edmonds. "Our work is on a small scale though, and many people with low income levels turn to cheap calories like fast food and other unhealthy food." Saline resident Lana Stiebe said she's healthy, but doesn't eat a healthy-enough diet. "I'm making subtle changes," she said. "I've suffered with weight issues all my life and I never stop trying to change that." "I've been following Weight Watchers for 10 years and sometimes I fall off the horse," said Dexter resident Nancy Larrow. "I know what I need to do, but I don't always do it, like eating enough servings of fruits and vegetables." Dave Starinshak, a graduate student at the University of Michigan, lost 35 pounds. "I started eating much more healthily the last few years, packing lunches and not eating out as much, and I feel great," he said. Mosley-Koehler said that improving people's health in the county and in the state will help revive Michigan's economy. "Creating a culture of health is the key to Michigan's economic transformation," said Mosley-Koehler. "Even small changes in health, such as moving more, eating healthy and not smoking, have the potential to transform both the costs Michigan employers are now burdened with, as well as the health of Michiganders. Employers' health insurance premium rates are a major determinant of where they locate. To reduce Michigan's premiums and health care costs, our health must improve." The Health Improvement Plan is a public-private partnership of more than 25 organizations and 300 individuals led by Washtenaw County Public Health, which uses the survey to work with partner organizations to support healthier choices. Mon, Nov 14, 2011 : 3:34 p.m.
Mon, Nov 14, 2011 : 8:41 p.m. True. I would be far more depressed if my golden faucet broke in my fifth bathroom than if my child died from dysentery or I faced certain death from AIDS. It has nothing to do with the lack of psychiatrists in these poor countries available to diagnose anxiety or depression. Success in life is the cause of depression. That is why I, a rich man, am an out of control cocaine addict, and why I, a rich man, deserve more money for enduring the sacrifice of being wealthy. Mon, Nov 14, 2011 : 1:27 p.m.
Let's see here...depressed? En masse? But why? Conservative capitalism destroys all classes below the disgustingly rich, Liberalism destroys everything equally. We've sold out to China, health insurance costs are going up like a rocket, monthly fuel costs are equal to a mortgage payment (yet who can even qualify for one), ALL elected officials lie, or worse...and on it goes....no, no reason for all the depression. Mon, Nov 14, 2011 : 12:25 p.m.
Sheesh an article on health turns in an infomercial for the Farmers Market...no mention of the outrageous prices charged. Farmers markets exploit the real proletariats lining the pockets of the greedy 1%. Mon, Nov 14, 2011 : 2:45 a.m.
Mon, Nov 14, 2011 : 2:06 a.m.
Don't worry, with the recession, there is less tax revenue and with Obamacare, an increased demand on the government dime, which means our system will fail. I love liberals, willing to doom the country instead of the individual. Mon, Nov 14, 2011 : 3:01 p.m.
doom the country instead of the individual? I suppose you'd rather doom the people? What is the USA anyway except it's people? Bizarre. Mon, Nov 14, 2011 : 1:52 a.m.
We (seven of us) and a bunch of kids we knew grew up on raw milk. None of us have weigh problems and none of us were ever on any medications. No one we ever knew got sick from raw milk, so I think it I'd gear mongering by corporations with a financial motivation. And even if you did get sick, it's not like there are not any number of natural substances that would provide quick relief. Sun, Nov 13, 2011 : 9:44 p.m. I am pleased with the results, but I wish this were not publicized. As a major shareholder in the multinational media corporation that owns over 1500 media organizations including this one, I will ensure that nothing incriminating like this is published again. Capitalism has failed for most, but it is a tremendous success for me. As people sink into depression and exhaust their savings, unemployment, and health, they will be more willing to take low paid work, meaning more profits for me. I am unhappy with the current rate of profit and will continue to sit on my billions and let my factories lie idle while people perish from want for material goods, until they are willing to take wages that do not allow them to purchase them. Sun, Nov 13, 2011 : 6:50 p.m.
Is the cost for one tomato really $3.00 as in the photograph? How can someone who doesn't earn a good income afford that? I am thankful that we have a garden. I just didn't realize how much it was worth. Sun, Nov 13, 2011 : 7:58 p.m.
Sun, Nov 13, 2011 : 5:27 p.m.
WHO ARE THESE DEPRESSED? : Kindly clarify the second sentence of this story. 22 percent of the County or is that of the Country were diagnosed with Depression during 2010. Who had established this diagnosis of Clinical Depression? This story is describing the results of a survey and how could this diagnosis be established based upon a survey? The second part of the same sentence claimed that 14 percent reported 10 or more poor mental health days in the month prior to this survey. What is the connection between the first and second statements of this second sentence? What type of Depression is being described here? Are we dealing with a problem called Acute Depression, or is this a problem of Chronic Depression that the Survey has uncovered? To whom are we selling this Survey? In any case, thanks for giving me the benefit of a Poor Mental Health Day. Mon, Nov 14, 2011 : 1:16 p.m.
All these questions...stressing me out to read...oh no...now I'M depressed!!!! A2 has been living in a spoiled brat economy any way. Now the belt is getting tight and everything is costing more and more. The time is here A2, for reality is setting in to your neighborhoods. Sun, Nov 13, 2011 : 3:30 p.m. Curious how federal subsidies go towards unhealthy grains grown by big ag while small farmers selling raw milk get raided by our government minders. You'd think that it was official federal policy to drive up business for the medical industrial complex. I really need to plant a decent garden this coming spring. Mowing grass seems like an insane waste of effort. Sun, Nov 13, 2011 : 6:57 p.m.
Sun, Nov 13, 2011 : 4:46 p.m.
That would be a step in the right direction anyway. Sun, Nov 13, 2011 : 1:45 p.m. I agree with Stephen re: The Farmers Market -- not only are the prices competitive and affordable, the money is going directly to the farmers. They are open on Wednesday and Saturdays -- it is a great place to shop. Indeed, times are tough, but we as individuals need to get tougher and move forward. Due to higher prices, I've cut back on lots of food items that would be in the snack category or &quot;is the item really necessary&quot; focusing on more nutritious items. I believe the US citizens will come through this period -- I hope all of you out there do as well. Sun, Nov 13, 2011 : 1:29 p.m.
Mon, Nov 14, 2011 : 2:56 p.m.
Hope and Change went away during the 2010 election cycle. Republican obstructionism and Democratic party dithering were the causes. Sun, Nov 13, 2011 : 12:03 p.m. Being downtown Ann Arbor residents, my wife and I love the Farmers Market, Food Coop and Kerrytown grocery shops. Another thing that is really excellent and I highly recommend is an Internet organic food cooperative called Door-To-Door Organics (<a href="http://www.doortodoororganics.com)" rel='nofollow'>www.doortodoororganics.com)</a>. They deliver to the door of our home each week a variety of in season high quality organic fruits and vegetables. In our experience the quality is better than Whole Foods at lower cost. They inform us in advance what the next shipment will have. If we don't like something we can log into our online account and ask them to swap that out for something else we do like and they take care of it. It's a very nice service that supports local growers. Over the past few years that we've been getting our weekly delivery we have increased our consumption of organic fruits and vegetables. Sun, Nov 13, 2011 : 5:42 p.m.
Great tip, thanks. Seems like a nice idea for a gift as well.